Objectives To determine whether postoperative delirium predicts first-time readmissions and mortality in octogenarian patients within 180 days after aortic valve therapy with surgical aortic valve replacement (SAVR) or transcatheter aortic valve implantation (TAVI), and to determine the most common diagnoses at readmission. Design Prospective cohort study of patients undergoing elective SAVR or TAVI. Setting Tertiary university hospital that performs all SAVRs and TAVIs in Western Norway. Participants Patients 80+ years scheduled for SAVR or TAVI and willing to participate in the study were eligible. Those unable to speak Norwegian were excluded. Overall, 143 patients were included, and data from 136 are presented. Primary and secondary outcome measures The primary outcome was a composite variable of time from discharge to first all-cause readmission or death. Secondary outcomes were all-cause first readmission alone and mortality within 180 days after discharge, and the primary diagnosis at discharge from first-time readmission. Delirium was assessed with the confusion assessment method. First-time readmissions, diagnoses and mortality were identified in hospital information registries. Results Delirium was identified in 56% of patients. The effect of delirium on readmissions and mortality was greatest during the first 2 months after discharge (adjusted HR 2.9 (95% CI 1.5 to 5.7)). Of 30 first-time readmissions occurring within 30 days, 24 (80%) were patients who experienced delirium. 1 patient (non-delirium group) died within 30 days after therapy. Delirious patients comprised 35 (64%) of 55 first-time readmissions occurring within 180 days. Circulatory system diseases and injuries were common causes of first-time readmissions within 180 days in delirious patients. 8 patients died 180 days after the procedure; 6 (75%) of them experienced delirium. Conclusions Delirium in octogenarians after aortic valve therapy might be a serious risk factor for postoperative morbidity and mortality. Cardiovascular disorders and injuries were associated with first-time readmissions in these patients. This is the first study that systematically evaluates delirium for 5 postoperative days, focusing exclusively in octogenarian patients undergoing aortic valve therapy with surgical aortic valve replacement (SAVR) or transcatheter aortic valve implantation (TAVI), and aiming to establish whether delirium predicts first-time readmissions and mortality within 180 days after hospital discharge. The high rate of inclusion in this study ensures that the data are representative of octogenarians with severe aortic stenosis referred for SAVR or TAVI and makes our results comparable to other studies that sampled more populated areas. Data are limited to a tertiary university hospital. This study concentrates in the time period within 180 days after hospital discharge after aortic valve therapy with SAVR or TAVI, and longer follow-up periods might be necessary to address other consequences of delirium in this patient group. The relationship between delirium, cardiac surgery and undesirable events such as hospital readmissions and mortality has previously been studied.10 ,11 However, to the best of our knowledge, the role that delirium plays in these outcomes in the oldest group of patients after receiving SAVR or TAVI remains to be established. Little is known also about the causes of short-term and long-term readmissions in this patient cohort. Therefore, the aim of this study was to (1) determine whether the presence of postoperative delirium can predict the risk of first-time readmissions and mortality in octogenarian patients within 180 days after SAVR or TAVI, and (2) to identify causes of these first-time readmissions (ie, discharge diagnoses) in patients who had delirium. We hypothesised that delirium leads to higher rates of readmission and mortality. We conducted a prospective cohort study of consecutively admitted octogenarian patients treated for severe aortic stenosis (AS) with SAVR or TAVI. The study was performed in a tertiary university hospital in Norway. This hospital is responsible for performing SAVR and TAVI procedures for the entire western region of Norway, which comprises more than 1 300 000 inhabitants.12 Follow-up was performed 30 and 180 days after hospital discharge. Participants were recruited into the larger ‘Delirium in octogenarians undergoing cardiac surgery or intervention (CARDELIR)’ study.9 Inclusion criteria were age of 80 years or older and previous acceptance for elective AS treatment with SAVR or TAVI. Exclusion criteria were patients' declined consent to join the study or inability to speak Norwegian. The primary end point of CARDELIR was the presence of postoperative delirium. Flow chart of included patients. A description of data collection at baseline and the assessment of postoperative delirium were presented previously.9 Briefly, patients fulfilling the inclusion criteria were identified and approached the day before surgery. The study was explained and participants gave informed consent to enrolment before data collection started. Delirium was assessed by the first author and by members of the research team trained in the use of CAM. These members have their clinical practice at the Department of Heart Disease and they participated in information meetings regarding delirium given to healthcare providers in our department. They also received one-on-one sessions that covered more extensive knowledge regarding delirium, that included several examples about its features and that explained the use of CAM. Assessment of delirium was performed daily, at noon, from postoperative day 1 to day 5, including weekends. Medical, nursing and physiotherapists' reports from the previous 24 hours were also considered when CAM was scored. The hospital information registry provided information required to identify first-time readmission and discharge diagnoses in accordance with the International Statistical Classification of Diseases and Related Health Problems, 10th Revision (ICD-10).28 The registry also helped to identify time of death for deceased patients who had been assessed for delirium earlier. 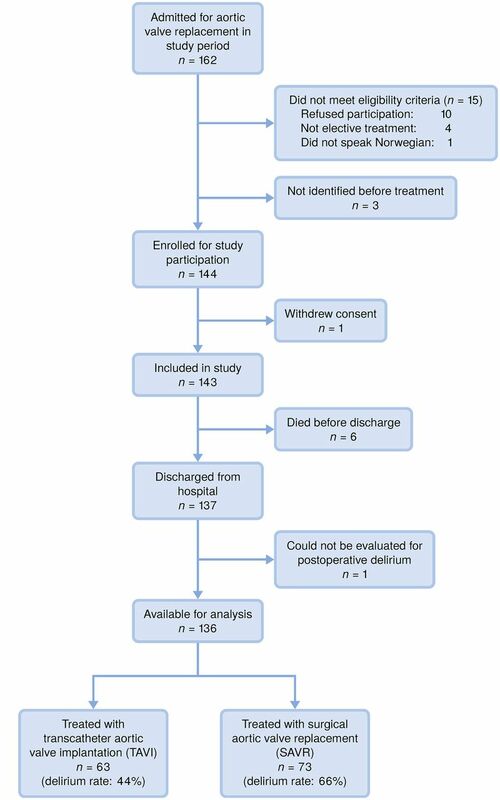 The primary outcome was a composite variable of time from discharge to first all-cause readmission or death, from hospital discharge to 30 and 180 days after discharge. Secondary outcomes were all-cause first readmission alone and mortality 30 and 180 days after discharge, and the primary diagnosis at discharge from first-time readmission. Gender, age, baseline MMSE scores and comorbidity (CCI), as well as type of therapy (SAVR and TAVI) as confounders, were selected based on guidance from previous literature29 ,30 and clinical experience. Data are presented as counts and percentages, or means and SDs. Differences between groups at baseline were tested with the χ2 test for categorical variables and the t-test for continuous variables. The Kaplan-Meier survival curves and an exact Gehan-Breslow test stratified by type of aortic valve therapy were used to examine and test for differences in time to readmission/death. The Gehan-Breslow test was chosen because it places greater weight on early events. The exact conditional distribution of the test statistic was evaluated using a Monte Carlo procedure with 100 000 replications, using the R package ‘coin’31 V.1.1-2. The Cox proportional hazard regression analyses stratified by therapy type (SAVR/TAVI) were used to adjust for gender, age (as a non-linear/quadratic effect), MMSE and comorbidities. Statistical analyses were performed using IBM SPSS for Windows, V.22.0 (IBM SPSS Statistics for Windows [program]. 22.0 version. Armonk, NY: IBM Corp, 2013) and R V.3.2.3 (R Foundation for Statistical Computing, Vienna, Austria) (R Core Team. R: a language and environment for statistical computing. Secondary R: a language and environment for statistical computing. 2015. https://www.R-project.org/). A two-tailed p value of ≤0.05 was considered statistically significant. Research involving older patients requires special consideration with respect to functional disabilities and complex health conditions. Therefore, data collection was performed by members of the research team with extensive experience with geriatric and cardiac patients. Special attention was paid to signs of distress or fatigue, and data collection was stopped when such signs were present. In order to guarantee confidentiality, independent access to information regarding first-time readmission from each of the five referring hospitals the patients belonged to had to be obtained. No patients were involved in the design and implementation of the study. However, patient self-report is at the very core of the CARDELIR study.9 ,14 ,32 ,33 Also, 10 patients participated in qualitative interviews to describe their experiences with delirium.34 There are plans to disseminate the results of the research to the patient community through patient organisations. Table 1 shows the overall baseline characteristics of included patients (n=136). Table 2 presents characteristics of patients assessed for delirium, according to readmissions or death 30 and 180 days after discharge from SAVR or TAVI. Compared with patients treated with SAVR, octogenarian patients undergoing TAVI were older (82.3 vs 84.8 years, p<0.001); had lower MMSE scores (26.5 vs 27.8, p=0.009); greater number of comorbidities (2.4 vs 1.8, p=0.001); higher logistic EuroSCORE (19.6 vs 9.4, p<0.001) and more often had American Society of Anesthesiologist physical status classification system (ASA) scores of IV (21 vs 2, p<0.001). No differences in gender (63% female vs 51% male, p=0.11) or in the performance of ADL (18.8 vs 19.0, p=0.31) were found between the SAVR and TAVI groups. Of the 136 patients assessed, 56% developed delirium. Delirium was identified in 44% of patients treated with TAVI and in 66% of those receiving SAVR (p=0.01). The average number of days with delirium for patients treated with SAVR was 1.5 days and for patients treated with TAVI, 1.1 days (p=0.20). A table showing living environment within 30 and 180 days after open surgery or transcatheter intervention is presented in online supplementary appendix 1. Figure 2 presents the proportions of types of discharge diagnoses following first-time readmission, 30 and 180 days after therapy with SAVR or TAVI, according to the ICD-10, and stratified by the presence/absence of delirium. Proportions of discharge diagnoses or death following first readmission/death within 30 or 180 days after initial discharge, according to the presence of delirium and in accordance with the International Statistical Classification of Diseases and Related Health Problems, 10th Revision (ICD-10). Of the 30 patients (22%) readmitted for the first time within 30 days after SAVR or TAVI, 24 (80%) had delirium. The majority of readmitted patients in the delirium group returned to the hospital for cardiovascular disorders with no dominant-specific diagnoses, and only two patients returned because of heart failure. Eight per cent of the readmitted patients in the delirium group exhibited symptoms such as chest pain and dyspnoea, and had contact with health services, whereas 4% of the readmitted patients were hospitalised for external injuries such as fall injuries. Cardiovascular disorders were causes of first-time readmission in two of the non-delirious patients and another two were readmitted due to pneumonia. One patient in the non-delirious group died within 30 days after discharge. Of the 58 patients readmitted for the first-time within 180 days after aortic valve therapy, 37 (64%) were in the group that had delirium. Readmission diagnoses for patients who had delirium covered a wide variety of ICD-10 categories, with diagnoses related to the circulatory system being the most common (13%). Heart failure was identified in 4% of first-time readmissions, and complications after cardiac surgery in 3%. Additional readmissions were related to pulmonary hypertension and embolism, other heart diseases and myocardial infarction. Fall injuries or other complications resulted in 5% of first-time readmissions. In patients without delirium, diseases of the circulatory system were responsible for 15% of first-time readmissions. Heart failure and arrhythmias were the most common. Three patients (5%) were readmitted because of injuries like bone fractures, and three had pneumonia. Six out of eight patients who died within 180 days after aortic valve therapy had postoperative delirium. Figure 3 shows survival curves for 30-day and 180-day readmissions and mortality according to delirium and type of aortic valve therapy. 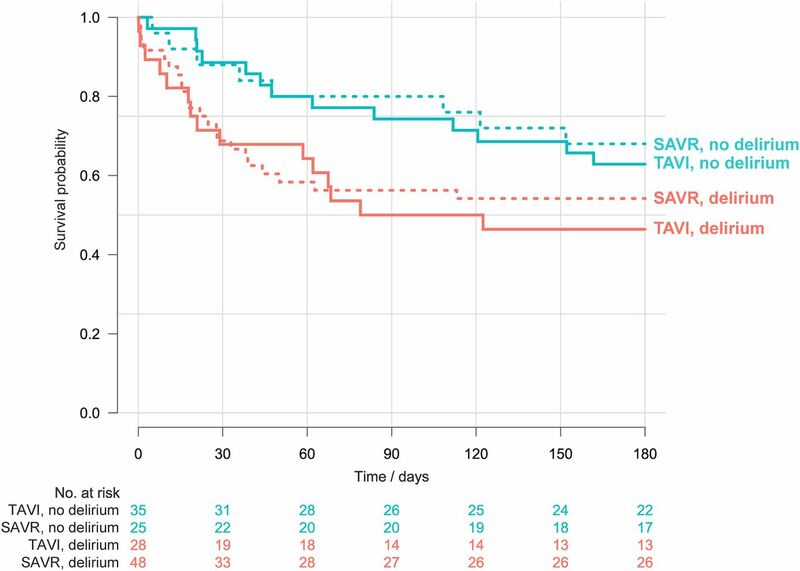 After stratifying for type of therapy (SAVR vs TAVI), differences were revealed in time to readmission and mortality between patients with and without delirium within 180 days after discharge (p=0.02). These differences were already present 30 days after discharge (p=0.006). Kaplan-Meier survival curves for first-time readmission or death, stratified by postoperative delirium and treatment procedure with surgical aortic valve replacement (SAVR) or transcatheter aortic valve implantation (TAVI). Initial analyses revealed that the effect of delirium was not well described by the Cox proportional hazard model (p=0.03 in a test for the proportional hazard assumption). Examination of Schoenfeld residuals indicated that the effect of delirium on hazard diminished over time, and this was particularly pronounced starting about 60 days after initial discharge. We therefore fitted a model using a factor for a time-dependent effect of delirium, in which the effect was constant up to 60 days (ie, assuming proportional hazards up to this time point) and then linear with time from 60 to 180 days (table 3). This greatly improved the model fit, and a test of model assumptions no longer indicated any lack of fit. The HR up to 60 days was estimated to be 2.9 (95% CI 1.5 to 5.7). The effect was reduced over time (an estimated reduction of about 3% for each day after the 60th day), but there is great uncertainty in these estimates, due to a low number of later events. For example, there were only six events between 120 and 180 days, making it impossible to obtain reliable estimates for the shape of the time-dependent HR for this period. Additional completely stratified analyses did not find any effect modification (results not reported). This prospective study shows that delirium is a serious postoperative complication that predicts first-time readmissions and death in octogenarian patients who have had SAVR or TAVI therapy. The number of first-time readmissions or deaths within 180 days after SAVR or TAVI was considerably higher for patients who experienced delirium, and this difference was especially pronounced within 30 days after therapy. The most common cause of first-time readmission in all included patients was related to heart failure; injuries and infections also were frequent diagnoses. In octogenarians who experienced delirium, reasons for first-time readmission covered all general diagnostic categories of the ICD-10, and included symptoms lacking specific pathology and contact with health services without a specific diagnosis. In the group not experiencing delirium, first-time readmissions were most often related to disorders of the circulatory system. Mortality was higher in the group of patients who experienced delirium. Despite originating from a single centre, this study includes data on the entire western region of Norway, which has a population of more than 1300 00035 and covers the total population of five other regional hospitals. Health services in Norway provide equal access to free hospital treatment, medication and hospital accommodation to everyone who is part of the National Insurance Scheme. Advanced treatments, such as SAVR and TAVI, are performed only in specialised hospitals like ours. The high rate of inclusion in this study ensures that the data are representative of octogenarians with severe AS referred for SAVR or TAVI in Norway and in other industrialised countries with a similar health system. This makes our results comparable to other studies that sampled from more populated areas.29 ,30 Octogenarian patients are increasingly being recipients of advanced treatments such as SAVR and TAVI, and our results may also be applied in other settings where advanced treatment is offered to the elderly. Previous research has provided important information regarding the survival of patients treated with SAVR or TAVI.36–38 The primary outcome of these studies was survival 1,38 236 and 5 years37 after the procedure. However, older patients seeking this therapy expect that it will not only increase their longevity, but also will reduce disability and help them avoid further hospitalisations.39 These expectations are at variance with our previous findings. We showed that patients treated with TAVI and who had postoperative delirium experienced significant decreases in ADL and IADL functions 1-month after therapy.14 A recent study also showed an association between physical impairment and 30 days all-cause hospital readmission.40 Moreover, in the present study, patients with delirium had a much higher rate of all-cause readmissions and death 30 days after discharge than those without delirium, regardless of the type of AS therapy. These results may suggest that patients at risk for developing delirium are more vulnerable at baseline and continue to be vulnerable at hospital discharge, hence explaining the higher risk for later hospitalisations and death. This highlights the effect that delirium may have in this patient group. Our results can be compared with those of a previous study on 30-day readmissions among patients treated with SAVR or TAVI.30 This study did not find significant differences in 30-day readmissions between therapy types. However, the study differed from ours in that it focused on readmissions as a function of therapy type only, and did not take delirium status into consideration. A recently published study examining 1-year mortality in SAVR and TAVI patients according to the presence or absence of delirium found a positive association between the presence of delirium and morbidity and mortality,41 a finding that is consistent with our results. However, their study differed in that its assessment was limited to the initial stay in the intensive care unit, used a retrospective design and did not assess readmissions and mortality within the first 6 months after discharge. Our study provides important new evidence showing that postoperative delirium is an undesirable outcome in older patients, especially octogenarians, undergoing treatment for AS. A previous study found a lower incidence of delirium after TAVI compared with SAVR.9 However, the short-term and long-term consequences of delirium for TAVI patients emphasise the need to implement strategies early on to reduce its development and also to possibly develop a specific TAVI risk score.42 Strong evidence supports multicomponent interventions to prevent delirium in hospitalised patients,43 and our results suggest that such interventions should be implemented in hospital settings where SAVR and TAVI are offered, especially since these procedures are often performed on older people. Knowledge about how delirium affects first-time readmissions and mortality following aortic valve therapy might facilitate clinical decision-making and dialogue between patients and physicians when deciding a treatment path. Better clinical tools to predict which patients are at risk to develop postoperative delirium are also warranted, as these tools would identify at-risk patients who should receive either medical treatment or undergo the least invasive surgical modality. There are several strengths to our study, including its prospective design and the use of a valid and reliable instrument to assess delirium for 5 postoperative days. The tertiary university hospital in which data were collected and the low number of patients who refused participation (6%) provides the possibility of generalisation not only in terms of the western part of Norway, but also to other western populations where SAVR and TAVI are offered to octogenarian patients. An additional strength is found in the fact that patient's readmissions were completely blinded for the research team. The lack of randomisation is a limitation. However, since SAVR and TAVI were offered different treatment groups with regard to surgical risk factors, a randomised design was not possible.2 The modest sample size has also limited the possibility of more analyses. Another limitation of our study lies in the lack of inter-rater reliability measurement. Even though the majority of assessments for delirium were performed by the first author, there were cases (ie, some weekends and holydays) where other members of the research team were responsible for using the CAM. It remains to be established whether delirium is causally related to the higher number of readmissions and deaths 30 and 180 days after discharge, or whether patients with several readmissions are already more vulnerable before aortic valve therapy, and therefore more prone to develop delirium. Future research should address the consequences of delirium in this patient group using a longer follow-up period. First-time hospital readmissions and mortality within 30 and 180 days after hospital discharge were more often present in octogenarian patients who had postoperative delirium after SAVR or TAVI therapy. Our results suggest that delirium may be a serious risk factor for negative events leading to readmissions and death in octogenarian patients treated with SAVR for severe AS, and even for those treated with the less invasive TAVI therapy.
. Functional evaluation: the Barthel index. Md State Med J 1965;14:61–5.
. A black mask covered his face…a death-mask. Experiences of delirium in octogenarians after aortic valve replacement. 5th Annual Meeting of the American Delirium Society; Baltimore, USA: Johns Hopkins University, 2015. Contributors LSPE, AHR, JEN and TMN are responsible for study concept and design. LSPE and TMN are responsible for data collection. KOH, LSPE, AHR and TMN are responsible for analysis of data. LSPE, AHR, KOH, BF, RH, KKJK, JEN and TMN are responsible for interpretation of data. LSPE, AHR, BF and TMN are responsible for initial draft of manuscript. All authors revised the paper critically for important intellectual content and approved the final version of the manuscript. LSPE, TMN and KOH had full access to all of the data (including statistical reports and tables) in the study and take responsibility for the integrity of the data and the accuracy of the data analysis. Funding This work was supported by a full research grant from the University of Bergen to LSPE. The study also received funding from Bergen University College, the Norwegian Nurses Association and Kavli Research Center for Geriatrics and Dementia. Ethics approval CARDELIR was approved by the Regional Committee for Ethics in Medical Research (REK Vest 2010/2936-6) and conducted in accordance with the Declaration of Helsinki.